Does Medically Supervised Weight-loss Effect Weight Loss After Bariatric Surgery? Introduction: It is a proven fact that the bariatric surgery is effective in the treatment of morbid obesity and as a consequence results in the improvement/resolution of obesity associated comorbidites. Yet health insurers have stringent guidelines for indication of bariatric surgery which includes multidisciplinary evaluation with different time lengths of mandatory medically supervised weight loss (MSWL). For reasons MSWL would result in patient education and in turn would lead to life-style changes quintessential for weight loss. The objective of our study is to evaluate the equivalence of weight loss between two major providers – HMO’s (MSWL ranging from 3 months to 18 months) and Medicaid and self pay group with one month of MSWL. 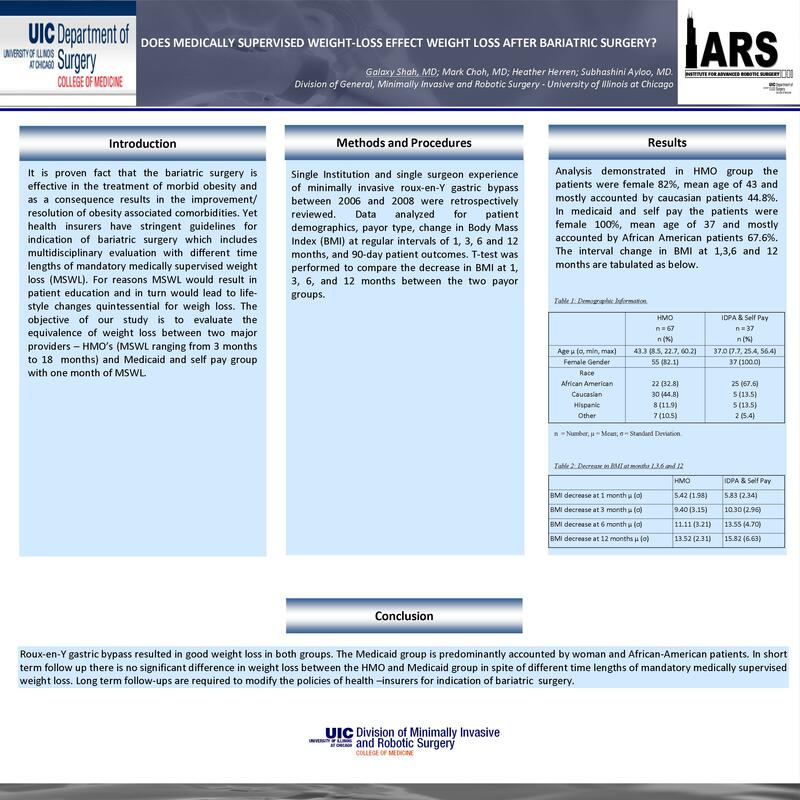 Methods and Procedures: Single institution and single surgeon experience of minimally invasive roux-en-Y gastric bypass between 2006 and 2008 were retrospectively reviewed. Data were analyzed for patient demographics, payor type, change in Body Mass Index (BMI) at regular intervals of 1, 3, 6 and 12 months, and 90-day patient outcomes. T-test was performed to compare the decrease in BMI at 1, 3, 6 and 12 months between the two payor groups. Conclusions: Roux-en-Y gastric bypass resulted in good weight loss in both groups. The Medicaid group is predominantly accounted by woman and African-American patients. In short term follow up there is no significant difference in weight loss between the HMO and Medicaid group in spite of different time lengths of mandatory medically supervised weight loss. Long term follow-ups are required to modify the policies of health-insurers for indication of bariatric surgery.